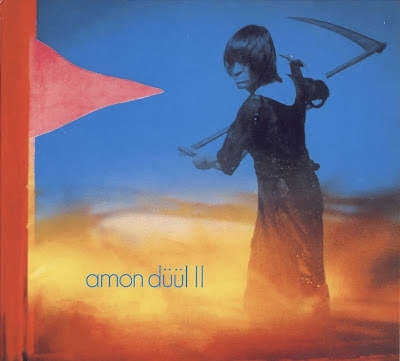 This was Munich-based Amon Duul II’s second album. By all means check out the first, Phallus Dei, because it’s difficult to decide which is the better of the two. Both are psychedelic classics. Buy now and ask questions later. Chris Karrer is the multi-instrumentalist genius at the heart of the band, singing, playing guitar, violin, saxophone and on stage, even sax mouthpiece, but this is not to detract from the rest of the group. halfway through the second side of the original 2-LP set starts out with acoustic guitars and bongos, but then in come the super-heavily phased drums and electric guitar to show you how full of contrasts the band were. "Yeti,” "Yeti Talks to Yogi,” and "Sandoz in the Rain” fill the remaining two sides of the album. The Yeti tracks are really one long jam, broken up by the duration constraints of the LP format. It's high intensity, free flowing improvisation throughout. There is little of the self-indulgent soloing which could sometimes spoil the long jams of other bands of the period, and there is a cosmic, spacey atmosphere, achieved without the use of studio electronics. Sandoz is an acoustic jam with guests Rainer (guitar, vocals) Ulrich (bass) and Thomas (flute). It provides a gentle conclusion to what has been a tumultuous album. The band became increasingly progressive after this album, but still managed to produce consistently good albums, Wolf City being one of the best of their later efforts. They also later had Daniel Fischelscher in their line-up who went on to play in the acoustic-cosmic band Popol Vuh, also worthy of a listen. Thanks o.e., this is one I needed to upgrade in my collection for a very long time.